Not gonna lie—the audio quality on this fan-shot video of Pearl Jam covering Neil Young’s “Rockin’ in the Free World” is not the best. And it’s not as if Pearl Jam don’t play this particular cover all the time—with Stephen Colbert on The Late Show! with Win Butler in Australia! with the general manager of the Chicago Cubs! with Neil Young himself at the 1993 VMAs! But hey, it’s a classic and it ain’t broke yet. 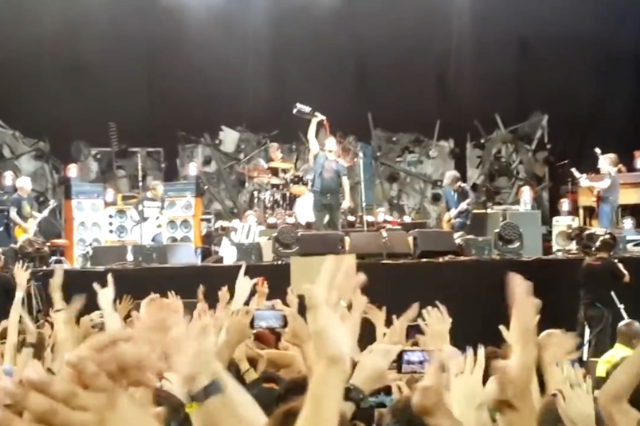 Last night (March 21) in Rio de Janeiro, Brazil, Pearl Jam played “Rockin’ in the Free World” with Red Hot Chili Peppers’ Chad Smith and Jeff Klinghoffer, and after handing out tambourines to the crowd, Eddie Vedder dumped a larger-than-average bottle of red wine over his head. Watch below (via Rolling Stone), or skip right ahead to the 3:55 mark for the wine tasting. Both Pearl Jam and Chili Peppers are on their way to headlining sets at Lollapalooza Brasil this weekend.